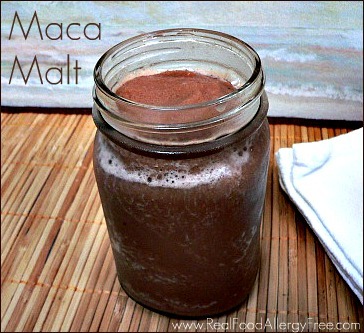 Today I am sharing about Maca Root at Quick and Easy, Cheap and Healthy. Maca root is a super-food that is packed full of nutritious goodness. It’s loaded with over 60 micronutrients, 18 amino acids and 20 fatty acids. Maca is 40% potassium, 10% calcium and contains vitamins A, B, C, D, E, B12, B1, 2, 3, iron, phosphorus, magnesium, silica and zinc. It is believed that maca is most beneficial because of its effect on the endocrine system. Maca is an endocrine modulator and the endocrine system includes all of the body’s glands and the hormones they secrete. Hormones regulate many, many things including tissue function, mood, growth and sexual development. You can find the recipe and learn how maca can help regulate hormones, increase libido and more at Quick and Easy, Cheap and Healthy. I love this post! Thank you for educating us about Maca root! The part about hormone balance really drew me in. Looks delicious! You’re welcome Amber! I think most of us will take all the help we can get with these crazy hormones! It’s at Quick and Easy, Cheap and Healthy http://quickeasycheaphealthy.com/2012/03/maca-mocha-smoothie/. I’ll update the post to be more clear. Thanks for asking! This sounds amazing! Yet with 8.5 kids I’m afraid to use it. I’m safe in the libido area. 🙂 Thanks for sharing just the same. I’ll check out your crock pot recipes right quick. That’s funny Kelle! I have four kids and I need maca just for the energy. I might be passed out if I had twice the kids. Thanks for stopping by!